A bit off the beaten track, but earlier today I received an interesting item from my friend Will Jarvis, world's leading expert on time capsules. Since experimental archaeology is already widely practiced, excavating a site a mere decade old cannot make ordinary sense but seems to be a further gimmick to keep alive the original gimmick of the trenchside banquet itself. Any activity that takes place beside a purpose-dug trench carries strong associations of evil intent, which I suppose could add to the fascination even if most people can't quite put their finger on it. The French and sumptuary cuisine epitomise Pierre Bourdieu's classic studies of 'distinctions of taste' as social markers, and all those films in the 1960s and 70s by Bunuel and others (Discreet Charm of the Bourgeoisie, etc.) in which patterns of eating were metaphors for social (dis)order; but the only purpose I can think of for the (premature) excavation of what was in any case originally a staged event trenchside is to refocus attention on the ephemerality of bourgeois foodways, which is increasingly fascinating to people - witness the enormous growth of cooking programmes and publishing - by exploiting popular interest using latest forms of communication technology. There would for instance in this case be no point in re-excavating if its only expression were in print media. But it all rehearses the time capsule theme. 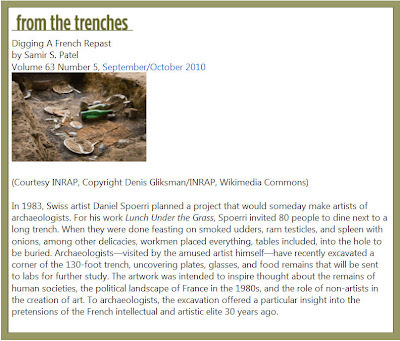 Aside from the social science perspective on Spoerri's project, I think it's useful to keep in mind that Spoerri is presumed to be an artist. So his buried repast can be viewed as a performance art work as well as a look into the ancient customs of the 1980s. And in my meanderings through the bars, restaurants, and cafes around the world, I've come across some photographers of food who are doing some amazing work transforming food into permanent art. In Turku, Finland I happened to stumble upon Seilo Ristimäki, one of Finland's leading advertising photographers. Seilo heads the Iloinen Liftari Studios, and is responsible for some breathtaking food photos. You can check out his site here.